NEW YORK – Rhinestones are named for Rhine stones, sparkly, highly coveted rock crystals found along Europe’s Rhine River. They date from the early 1700s, when Georg Friedrich Strass devised a method of backing faceted glass crystals with metal powder. As a result, light, instead of passing through their facets directly, refracted into brilliant rainbow spectrums. His individually cut, hand-finished pieces, also known as Strass and diamantes, were marketed as “poor men’s diamonds.” Nonetheless, many well-to-dos, fearing that their precious jewels would be lost or stolen, often commissioned rhinestone replicas to wear while traveling or attending public events. Since hand faceting and molding rhinestones was laborious, these faux ornaments were often as costly as their originals. 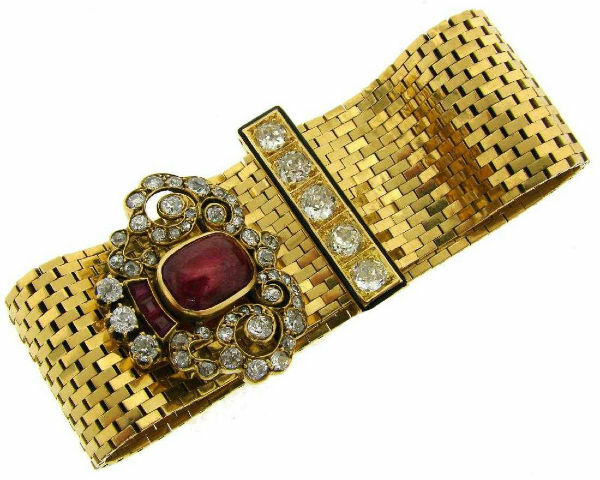 As jewelry became simpler, smaller and more elegant, colored rhinestones, created by backing clear stones with metallic foil in a variety of shades, became the height of fashion. Their shimmering, transparent shades, known as turquoise, sapphire or ruby-rhinestones, for example, reflect the gems they simulate. 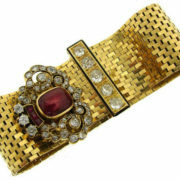 Colorful chokers, bracelets and brooches, featuring romantic floral motifs, were also charmers. In the late 1890s, as pieces became more extravagant, Daniel Swarovski, son of a Bohemian gem cutter, invented a water-powered machine that mechanically cut and faceted lead crystal faster, more precisely and affordably than before. Since each facet breaks reflected light into a striking rainbowed fragment, the more facets, the more flash. When their lead percentage was increased, Swarovski’s multifaceted creations grew flashier still. 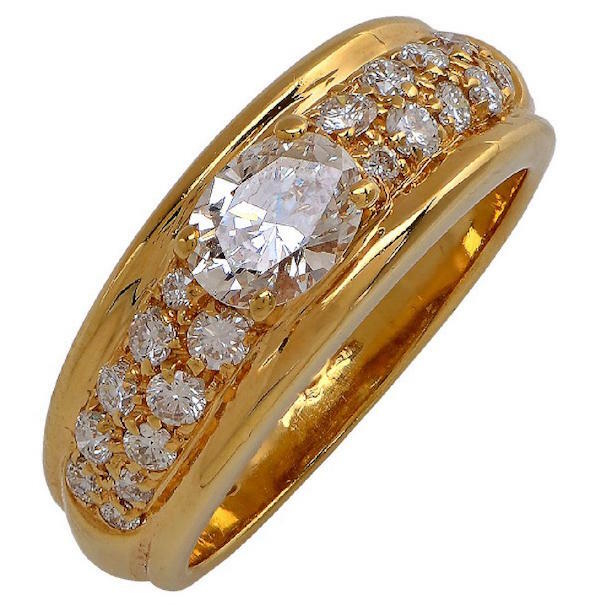 Indeed, due to their multiple, consistent facets and exceptional brilliance, many consider vintage Swarovski rhinestone pieces to be top of the line. Marked or signed ones in prime condition are doubly desirable. 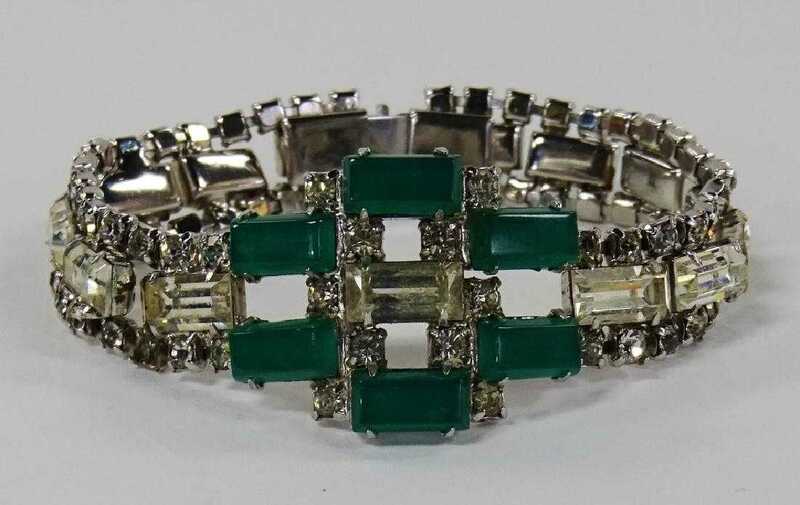 Costume jewelry bracelet with rhinestones and simulated emeralds, 6¾in. long, realized $60 in 2017. Image courtesy Auction Gallery of Boca Raton and LiveAuctioneers. At the turn of the century, when garnet or pearl petit point edgings adorned delicate diamonds, scores wore versions with less costly rhinestones. Some, instead, preferred romantic winged, whirled, or feathered bow hearts, bow knots, or floral spray brooches. Others flaunted showy, multihued, rhinestone frogs, dragonflies, swans, snails, peacocks or tortoises. Rhinestones came into their own, however, in the 1920s, when white-on-whites, say diamonds or white topaz on platinum, were the cat’s meow. Coco Chanel, parting from tradition, championed rhinestones not as diamond wannabes, but as glamourous, cutting-edge glories worn day or night. In time, glittery, mass-produced rhinestone earrings, hat pins, shoe clips and evening bags were available not only in exclusive shops, but also at five-and-dimes. 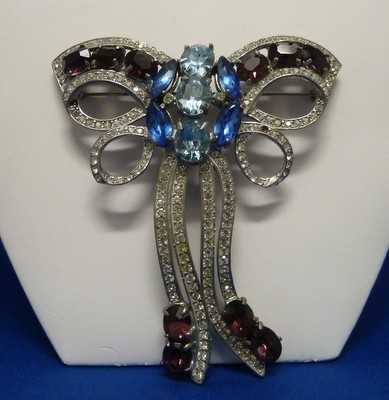 During the Great Depression, whimsical, brightly hued rhinestone flower, bird and butterfly brooches brightened the gloom. In addition, dazzling dress clips, hair clips and necklaces, inspired by Hollywood glitz and glam, made simple outfits look like a million. 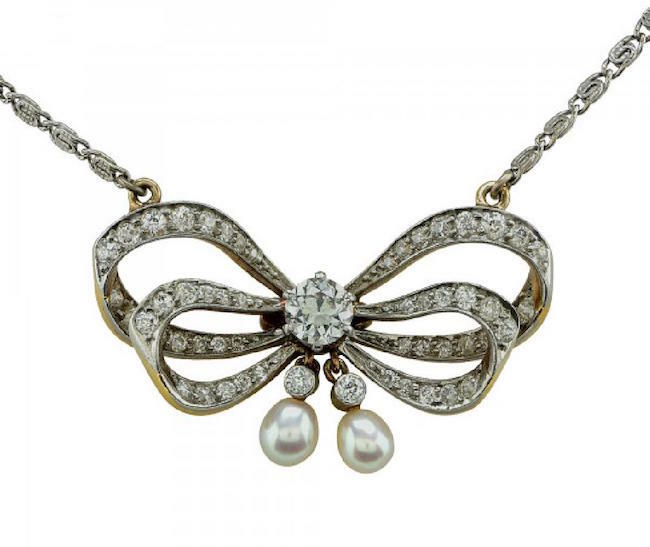 Through the following years, American manufacturers such as Coro, Haskell and Trifari, produced fine, detailed pieces of rhinestone costume jewelry, many with imported Swarovski stones. 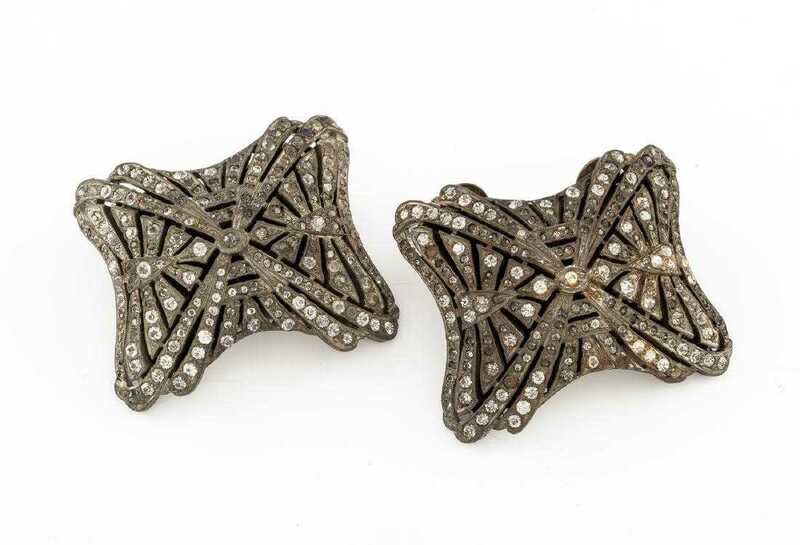 Exquisite, highly detailed Eisenberg & Sons dress clips, snowflakes and swirling bows were also popular. 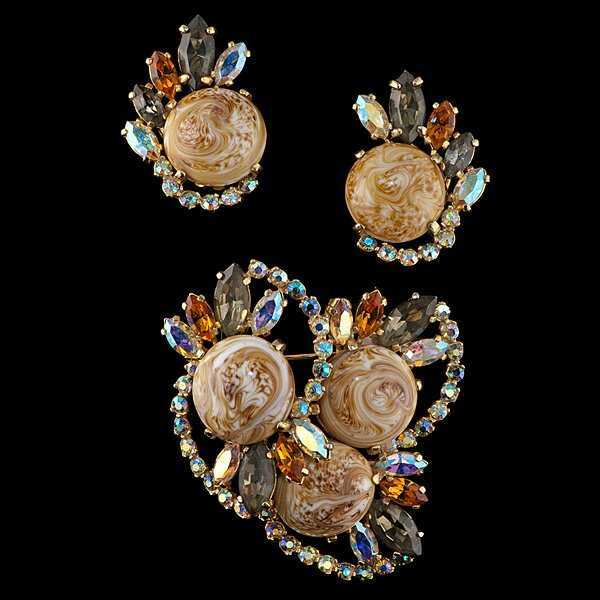 After World War II, when jewelry styles grew big and bold, many earrings, chokers and brooches bloomed with large-stone, razzle-dazzle rhinestone floral clusters. Others depicted birds, bows, snakes, scrolls or ribbons. In the mid-1950s, the Swarovski company introduced a new type of stone featuring clear glass crystals coated with micro-thin layers of vaporized blue metal. These extraordinary jewels, illuminated by bursts of colorful, otherworldly lights against pale-blue grounds, are known as Aurora Borealis (AB). Since they also reflect hues of nearby fabrics, they caused a sensation. Christian Dior, in fact, embellished scores of his signature evening gowns with them. Furthermore, when his exclusive rights expired, other famed designers, like Elsa Schiaparelli, quickly secured them. 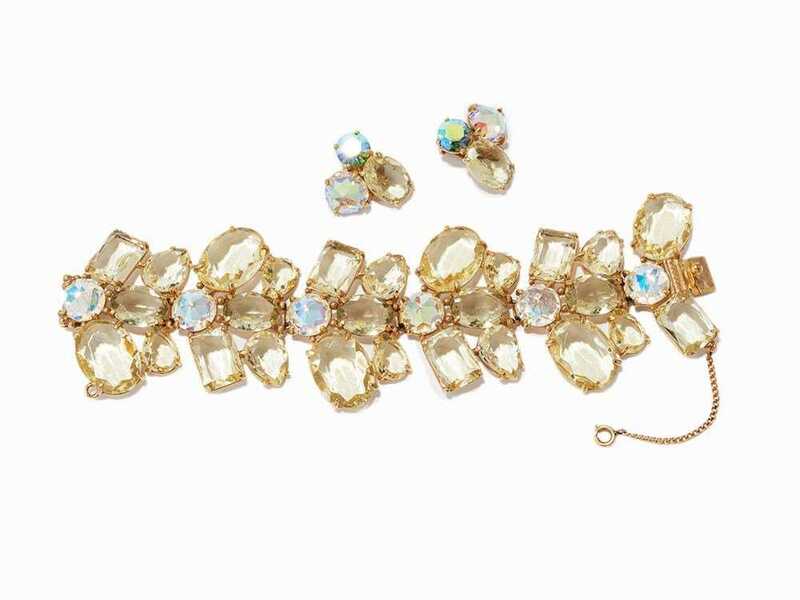 A vintage rhinestone creation is not only an unabashed fashion statement. It’s also a flash from the past. 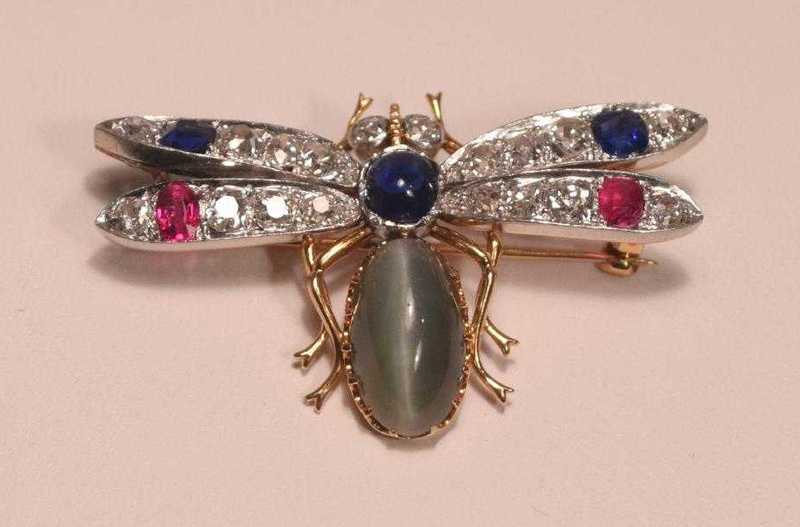 Fine jewelry and decorative arts inspired by Miami Beach living will be the exclusive fare of an online auction conducted by Jasper52 on Sunday, April 28. From Van Cleef & Arpels Alhambra and Cartier Panthere jewelry to the finest French silver, this special sale features only the best in jewelry, watches, decorative art and silver. 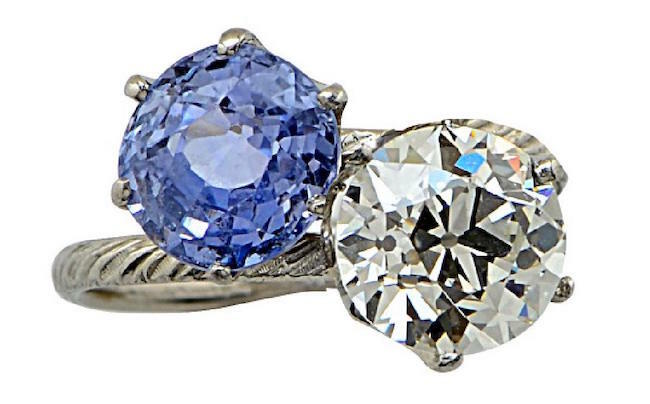 Van Cleef & Arpels, Cartier and Bulgari are several of the famous names that stand out in a diverse mix of designer jewelry offered by Jasper52 in an online auction Wednesday, Feb. 27. NEW YORK – Although coral reefs resemble underwater branched plants, they are actually colonies of tiny organisms living on limestone exoskeletons of their ancestors. 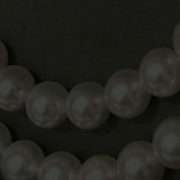 Precious coral, as the decorative type is commonly known, ranges from pale pink to deep red. Since it is colorfast and polishes to a high sheen, this gem-like matter harvested mainly along the Mediterranean coasts of France, Italy, Spain, Tunisia and Algeria has been esteemed for its beauty since ancient times. It was also prized for its purported restorative and protective powers. The ancient Greeks, believing that coral transformed from plant to stone when exposed to air, endowed it with wondrous powers. Many Greeks carried coral amulets to deter ghosts and witches, deflect lightening, neutralize poisons, avert shipwrecks, cure scorpion stings and repel curses. Other Greeks believed that coral was born of blood. As the legend goes, when mighty Perseus beheaded the snake-haired monster Medusa, her blood, as it seeped into seaweed, hardened into red coral. So, amulets featuring Medusa’s likeness were deemed especially protective. In addition, people reputedly relied on powdered coral to cure internal bleeding, diseases of the spleen and bladder ailments. Romans, too, believed that coral held therapeutic powers. Besides using it to treat snake bites and arouse libido, scores of them used powdered coral to quell life-threatening blood loss. Romans also draped pieces of coral around their children’s necks to guard them from harm. From the first century AD onward, coral traders plied “coral routes” to the Arabian Peninsula and through Central Asia to the Far East. Eventually, communities they served integrated this valuable “red gold” into their local traditions. Berber women in Morocco, for example, favored bracelets, ear ornaments and brooches featuring delicate coral beading or inclusions. Many also wore lavish necklaces or filigreed silver amulets enhanced with amber, silver beading, metallic coins and bits of coral. 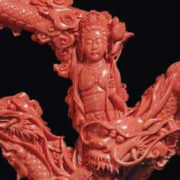 The Chinese, who perfected the art of hardstone carving, have long prized coral for its rarity and beauty. Artisans favored it because of its softness, which made it easy to “work” in fashioning pieces of wearable or decorative art. This craft rose to new heights during the Qing Dynasty, (1644-1912) when artisans, under Imperial patronage, carved fine, red coral figurines, jewelry and sculptures as royal tributes and ornaments. Their finest works, large, organic pieces featuring incredibly detailed images, frequently embodied auspicious wishes for good luck, wealth or longevity. 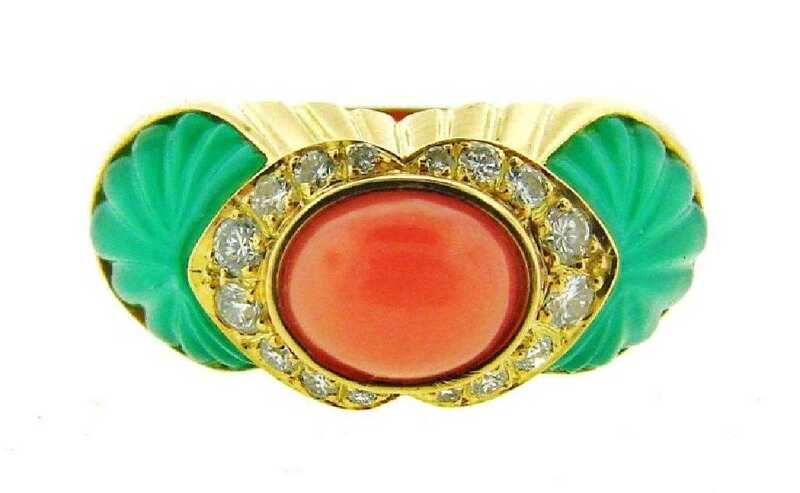 Coral jewelry was especially fashionable during the Victorian era, when British women embraced ostentatiously carved cameos, densely designed floral trinkets, and flashy gold, diamond or sapphire-set brooches resembling beetles, bugs or dragonflies. Yet, British journalist G.A. 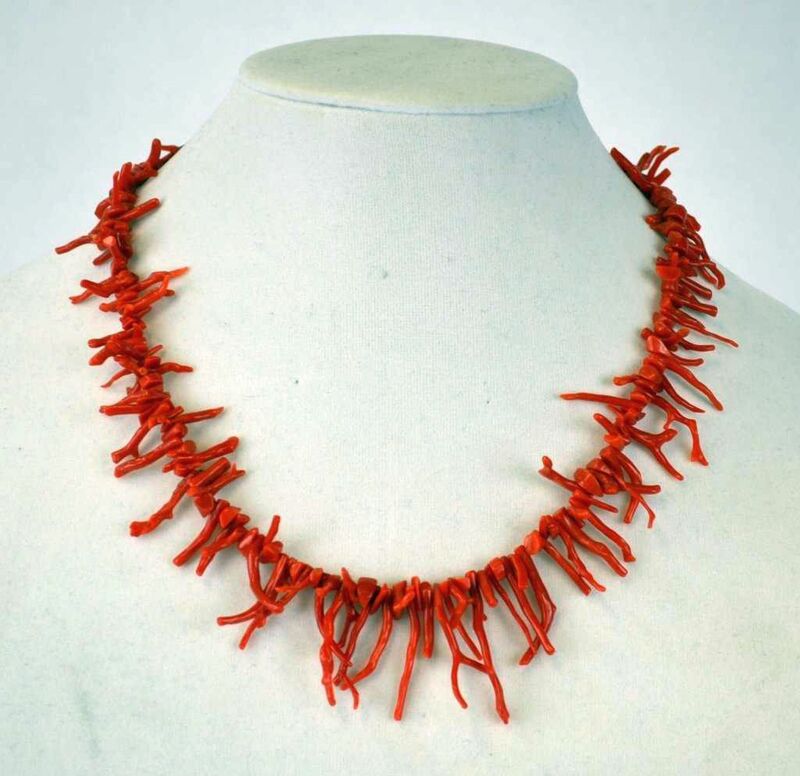 Sala noted in 1868 that coral jewelry “carelessly selected, clumsily set and ignorantly arranged … may become one of the most vulgar and unsightly of all ornaments.” Today, happily, Victorian coral jewelry, which is widely collected, is available in abundance. 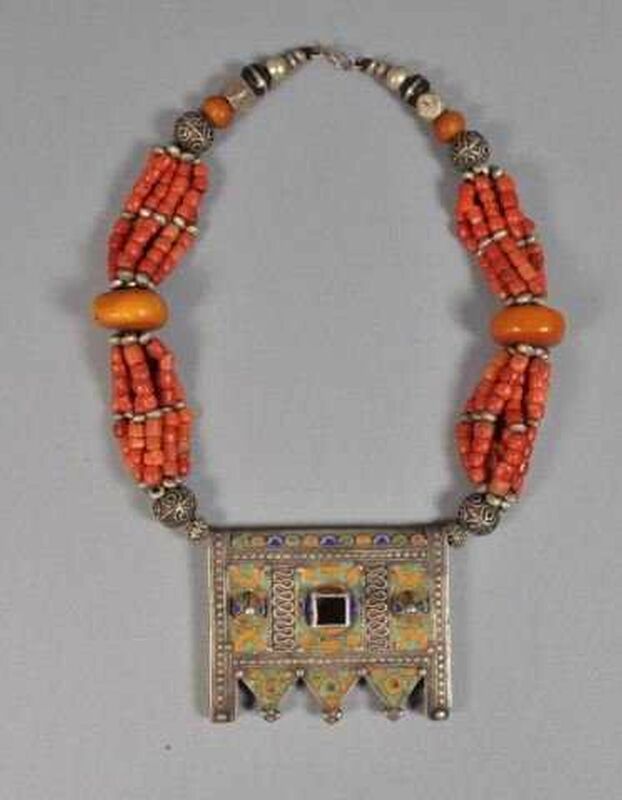 Spanish conquistadors introduced fine, red Mediterranean coral to the American Southwest in the 16th century, possibly as rosary beads or ornaments on najas, silver pendants hung on horses’ foreheads to avert the Evil Eye. It was not until much later that Navajo, Hopi and Zuni craftsmen began gem-working commercially. Their inlay work, delicately fashioned from coral combined with bits of turquoise, mother-of-pearl and black jet, often depict traditional tribal images like Rainbird, Sunface and Thunderbird. Alternately, many brooches, bracelets belt buckles, and bolo ties feature restrained, repeating coral beaded patterns. Coral necklaces range from impossibly petite, tube-shaped heishi beads and graduated, horny twigs to plump, shaped and polished cabochons. Contemporary Native creations, such as pins and rings, may dramatically integrate bits of unworked coral into traditional designs. Coral amulets remain popular, as of old. 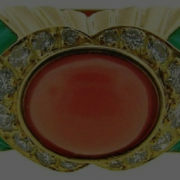 Many Italian men, for instance, carry or wear slightly twisted, horn-shaped coral cornicellos to deflect the Evil Eye. Their wives and daughters may prefer more delicate coral-twig earrings, pins or pendants. 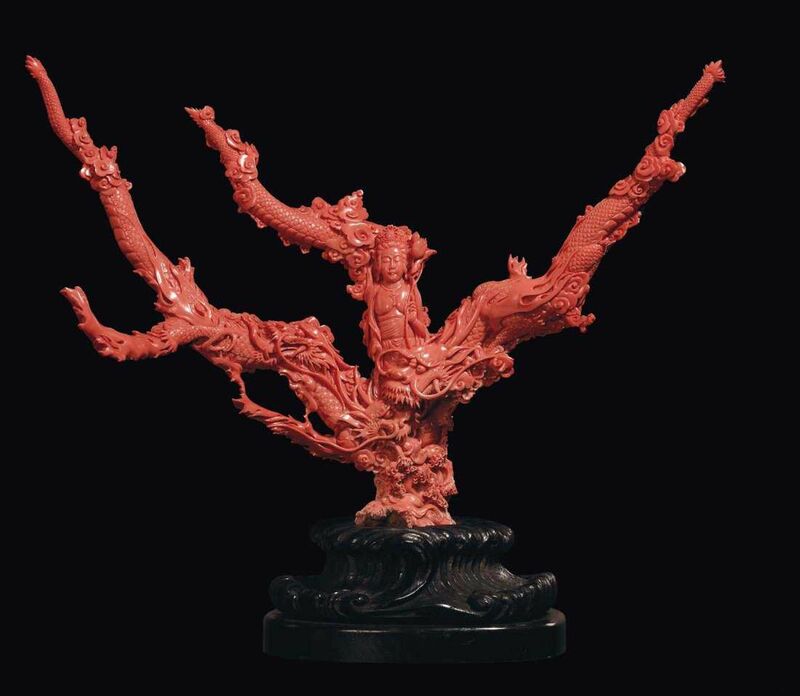 Today, too, enthusiasts scour auctions for authentic precious coral creations – superb sculptures, decorative natural specimens and enticing pieces of jewelry. All the dazzling colors of the holiday season can be found in an outstanding jewelry auction presented through Jasper52 on Tuesday, Dec. 18. Choices range from an elegant Van Cleef & Arpels pearl and diamond brooch to a colorful Cartier chrysoprase, coral and diamond ring. 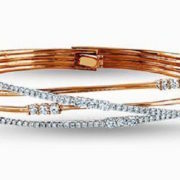 NEW YORK – In the glittering world of designer jewelry, David Webb has been a dominant name for decades – seven, to be exact. The company celebrated its 70th anniversary in 2018. While Webb may have been best known for the enameled animal bangles he introduced in the 1960s, the animal kingdom’s influence on the designer can be traced to a much earlier period of his career. Born in 1923 Asheville, N.C., Webb opened his first shop in New York City in 1948 at age 23. He previously spent a few years as an apprentice to his uncle, learning silversmithing and metalworking. The first item he ever designed was a copper ashtray signed with a spider in its web. From then on, animal motifs became a major part in his business. In fact, his company logo incorporates a golden W with a zebra. 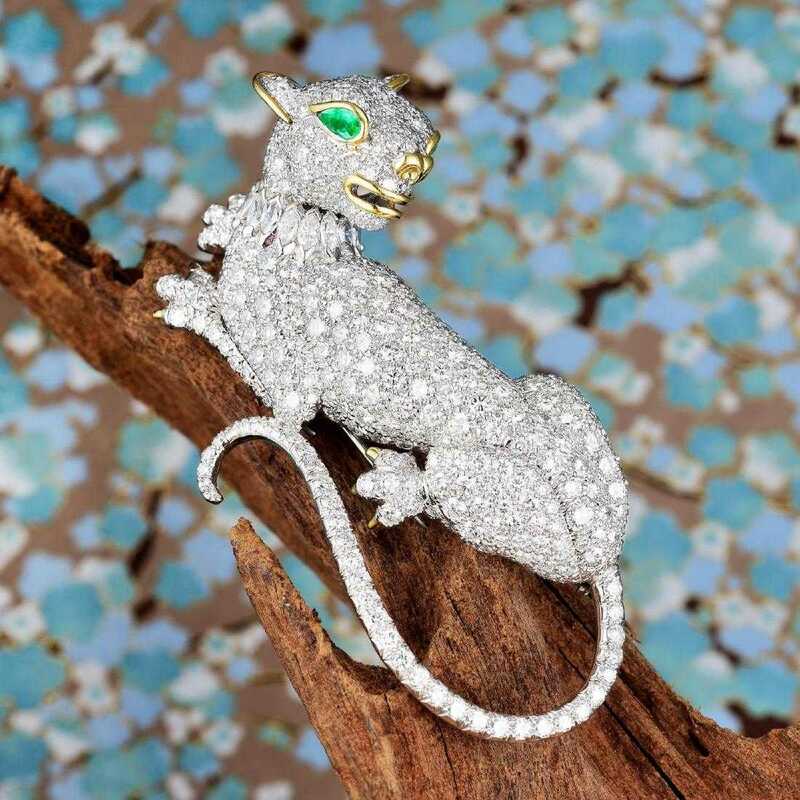 While Webb made jewelry of all kinds, from traditional gold and diamond rings to other forms that blended diamonds with semi-precious stones, his animal pieces brought him the biggest acclaim. 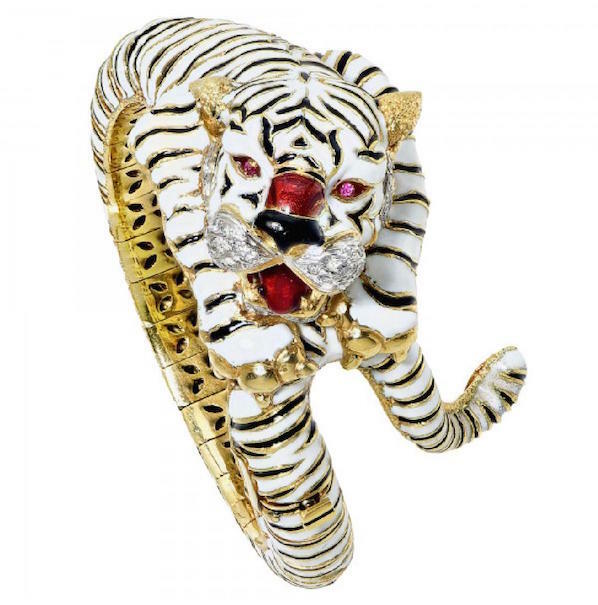 He himself quipped, “Women are tired of jewelry-looking jewelry, and they want one-of-a-kind pieces … Animals are here to stay,” according to www.DavidWebb.com. 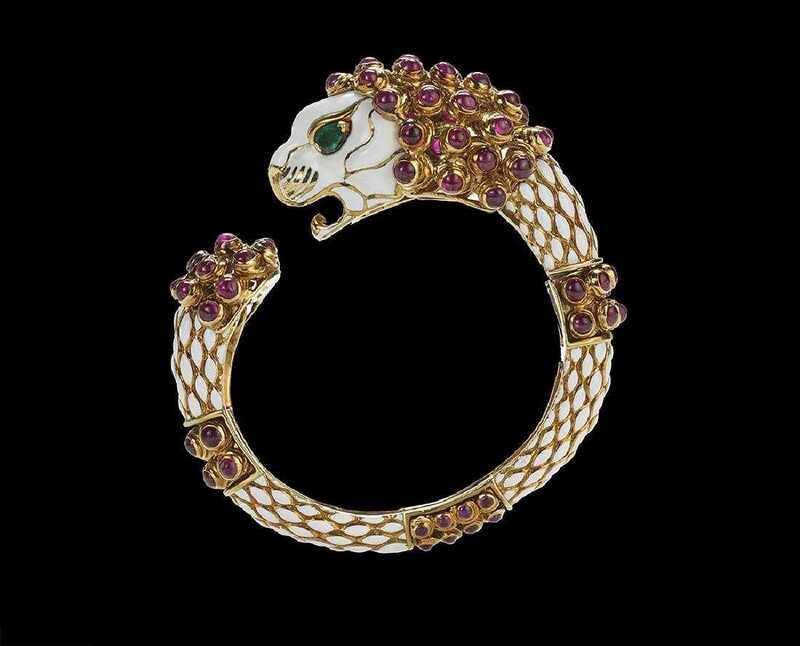 Webb worked animal figures into pins, necklaces and rings, but it is his bangle bracelets, usually enameled in bright colors, are iconic and highly collectible. 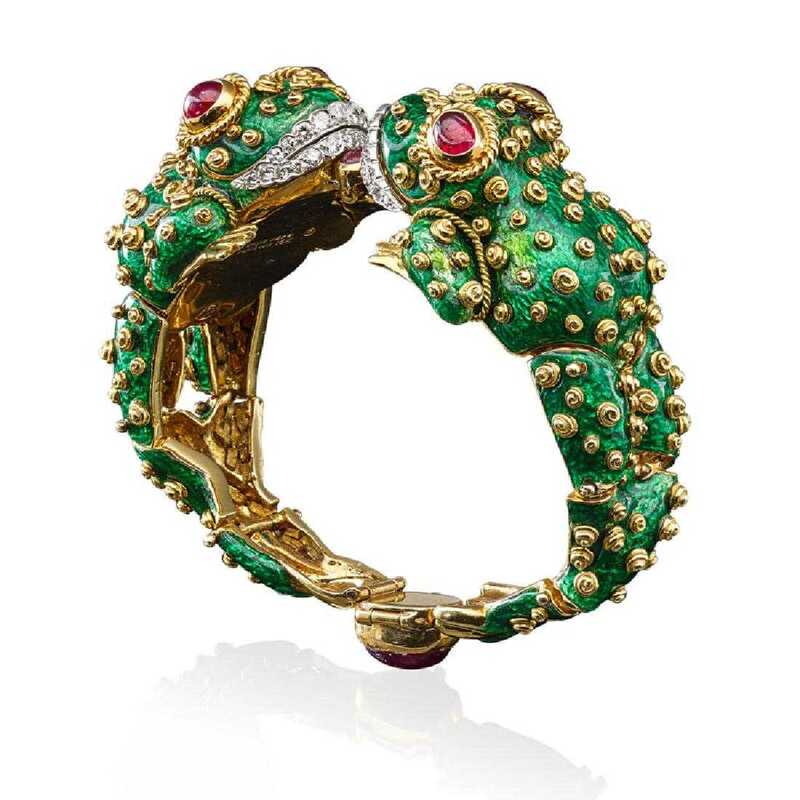 In 1957, he designed his first animal bangle with a dragon that contained cabochon emeralds, diamonds, platinum and gold. 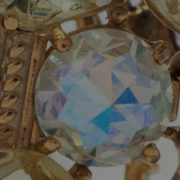 Screen legend Elizabeth Taylor bought the piece, which would later become known as the Elizabeth Taylor Makara Bracelet. This design opened up a world of possibilities, and a veritable zoo of animals followed – creatures both real and mythical that could fly, swim, slither or run, including frogs, panthers, zebras, horses, monkeys, snakes, leopards, alligators, seahorses and elephants. Taylor continued to be a fan and even wore her diamond-encrusted lion-and-pearl Webb designs when filming several movies. Vogue editor and columnist Diana Vreeland was an early champion of his work, and Vogue was among the first magazines to feature his creations. Two years after opening his own business, the magazine used a pair of Webb’s earrings on a model on the cover of a fall issue. Vreeland, herself a fashion icon, was rarely seen without her David Webb enameled zebra bangle bracelet or earrings. Besides Taylor and Vreeland, other celebrities and public figures have been Webb devotees. In 1962, first lady Jacqueline Kennedy selected Webb to make the official Gifts of State for the White House. Webb responded with a series of paperweights, some including animal themes, for visiting dignitaries. One of Mrs. Kennedy’s favorite Webb pieces was said to be a coral paperweight given to her husband, President Kennedy, as a gift. 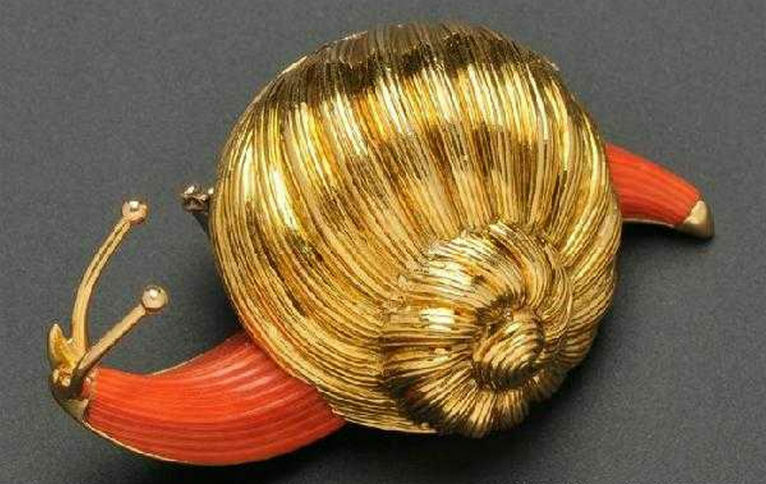 “Webb was entrusted by Jacqueline Kennedy to rework her late husband’s coral in 1966, using it to form the fish tail of typically imaginative mythical sea lion, cast in gold, which he rested upon a larger piece of coral amongst a bed of golden crystals to form the paperweight,” says a narrative on Sotheby’s website, which auctioned the item in 1996. Among Hollywood’s elite, two of the stars who favored David Webb jewelry were Barbra Streisand and Princess Grace of Monaco. Even after Webb’s death [from pancreatic cancer] in 1975, the company continued to produce striking designs that were in keeping with the founder’s artistic vision. 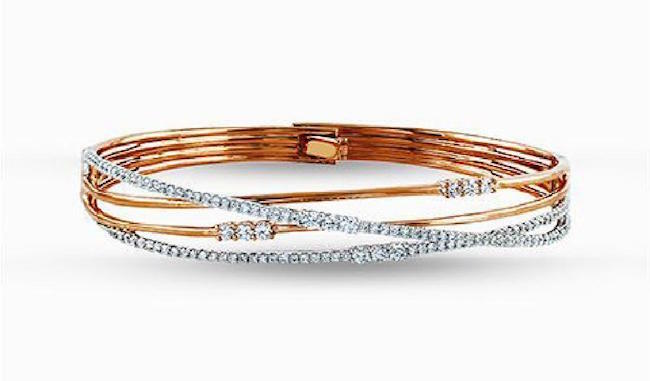 David Webb jewelry has been embraced by contemporary stars including Jennifer Lawrence, Beyonce, Amy Adams and Debra Messing, who don them to high-profile events such as the Met Gala, the Grammys and the Golden Globes. David Webb pieces are so beloved that their owners don’t often part with them, so they only appear at auction from time to time. 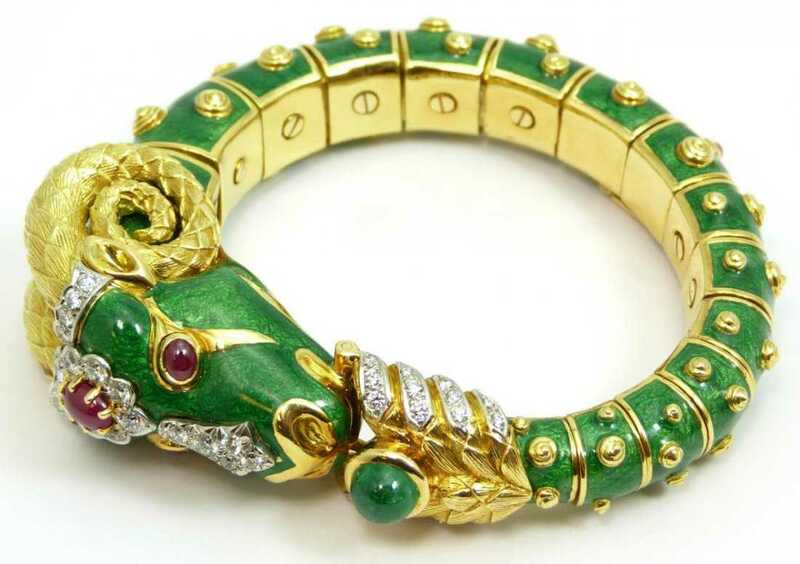 In April 2018, it was noteworthy when not one but two single-owner collections of David Webb jewelry crossed the block in New York. A sale at Bonhams New York was led by an amethyst, coral, emerald, rock crystal quartz, diamond and enamel pendant necklace featuring a pair of mythical creatures that realized $62,500; while Doyle New York’s sale of the Noel and Harriette Levine (who are major museum donors) collection starred a gold, platinum, enamel, diamond and cabochon ruby zebra bangle bracelet that sold for $40,625. 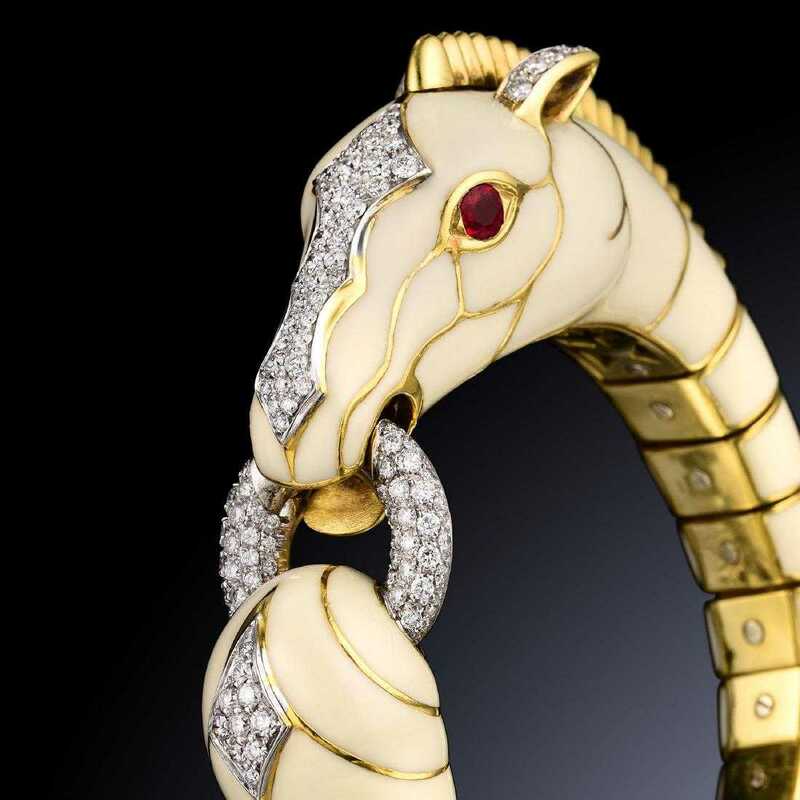 On LiveAuctioneers, Webb’s animal bangle bracelets consistently bring top dollar, from a Capricorn ram gemstone and gold bangle that brought $34,000 at Elite Decorative Arts in February 2015 to an enameled gold, diamond and ruby frog bracelet that was purchased for $30,000 at Rago Arts in June 2017. Long before “statement” jewelry was a thing, David Webb was making big, bold jewelry pieces that were distinctive and fun to wear. Fans today continue to appreciate his designs for their imaginative artistry, high-quality craftsmanship and enduring value as collectibles. 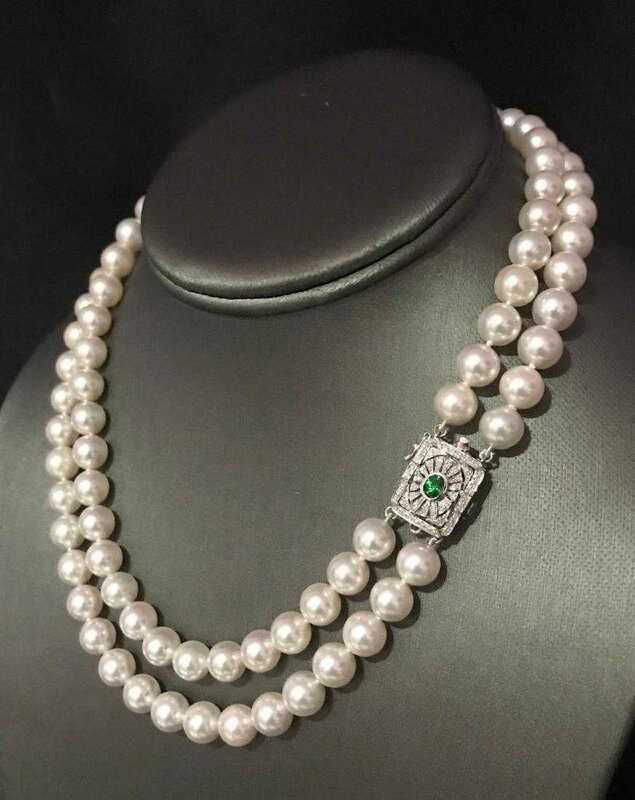 In time for holiday gift-giving to a special someone, Jasper52 will roll out the pearls in an exclusive jewelry auction Friday, Nov. 23. 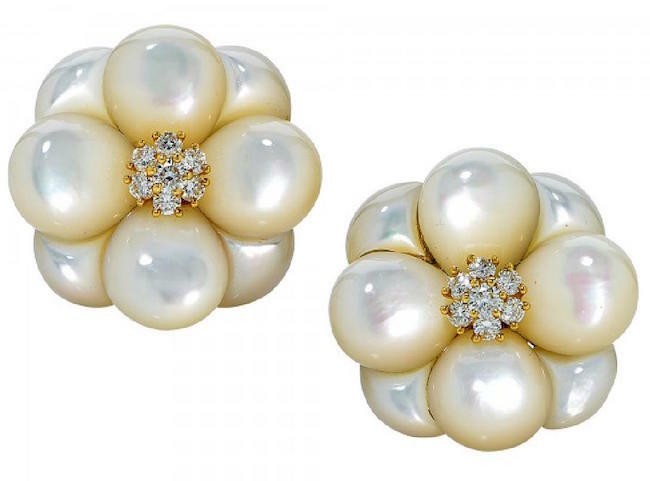 More than 100 lots—necklaces, bracelets and earrings—of certified pearl jewelry are being offered in this online auction, which showcases the beauty and versatility of fine pearls. A lot can happen in 170 years. In fact, quite a lot has since jeweler Louis-Francois Cartier took over at the Paris shop where he was an apprentice, following the death of master jeweler Adolphe Picard. While brands have come and gone as the global marketplace has evolved, the popularity of Cartier jewelry and watches has remained strong. Talk about staying power. A significant reason for the company’s relevance, especially in its first century operation, was due to the visionaries within multiple generations of the Cartier family. This is most evident in the company’s masterful watchmaking. 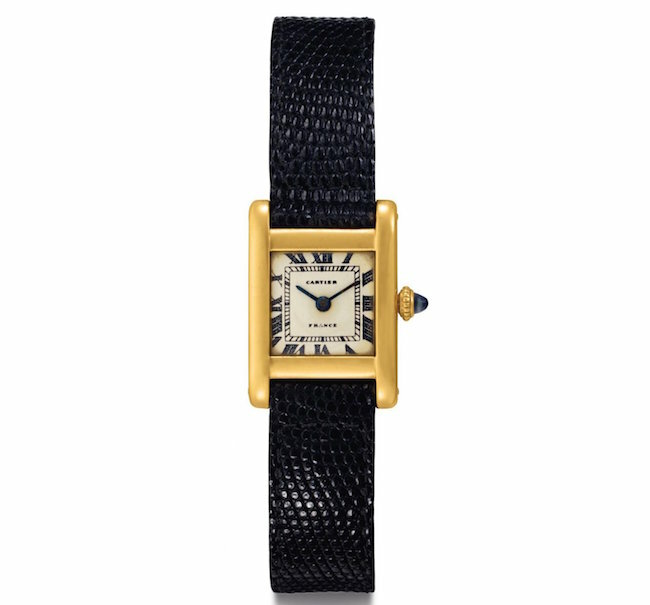 This Cartier watch exemplified the influence of Cartier’s roots in fine-jewelry design. 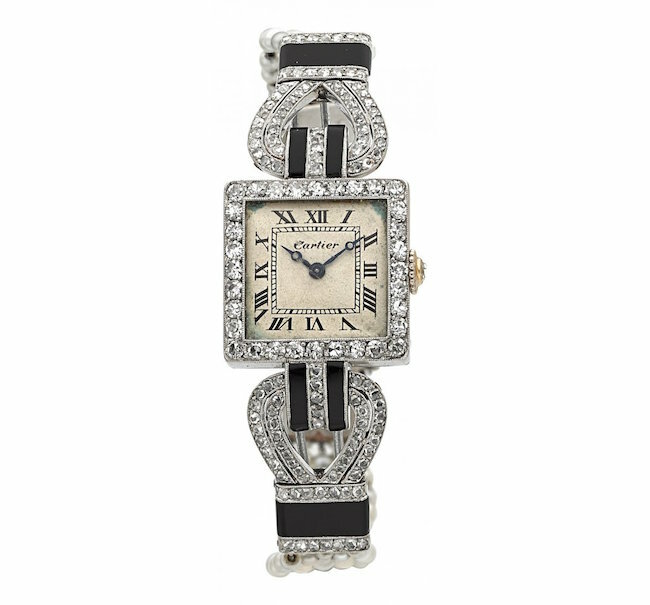 The platinum Art Deco ladies watch, circa 1915, features a “panther” design diamond and onyx on the setting and band, as well as graduated pearls on the band. 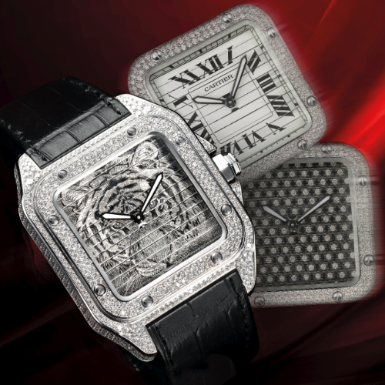 The timepiece is a creation of Cartier and European Watch & Clock Co. It sold in a 2016 Heritage auction for $42,500. Heritage Auctions image. 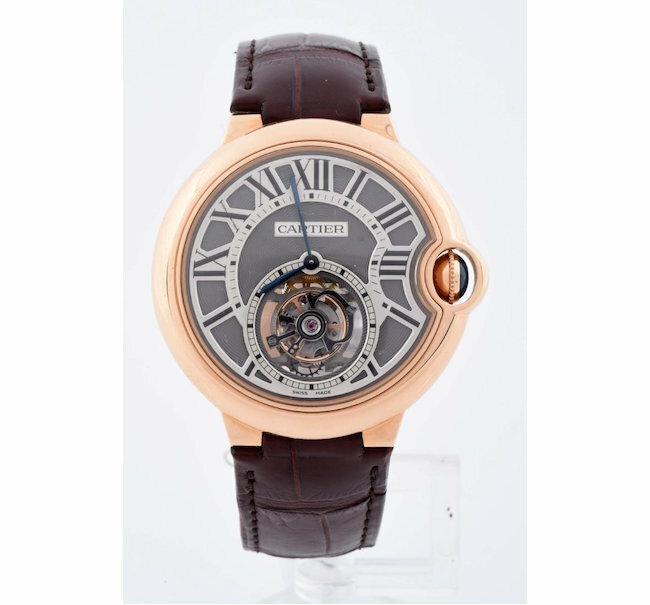 Cartier’s History: By the time Henry Ford had introduced the Model T automobile, created in an assembly line and available at a price more Americans could afford, Cartier’s watchmaking operation was already in its 20th year. When men were starting to get behind the wheel of a Model T, in 1908, their driving attire might have included Cartier’s Tonneau wristwatch. And if they were particularly well connected, they might be able to acquire the Santos, which was not readily available to the public until 1911. 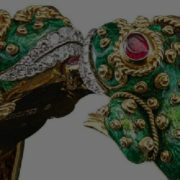 Cartier quickly became well known in European high society and abroad for creating lavish and unique items of jewelry. Applying the same approach the firm used in designing jewelry, Alfred Cartier (Louis- Francois’ son) expanded the company’s line to include timepieces. 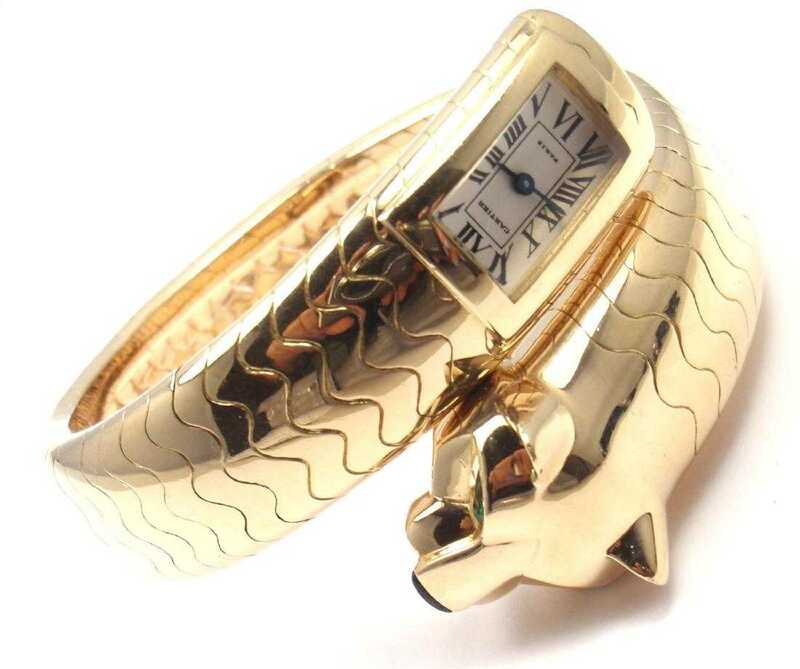 As explained in an introductory video on the Cartier website, the company’s foray into watches began with fob and chatelaine watches for women, followed in 1888 by the first ladies Cartier wristwatch. Alfred wasn’t alone in this timekeeping venture; by the turn of the 20th century, all three of his sons (Louis, Pierre and Jacques-Theodule) had joined the family business. However, working side-by-side in the company’s Paris headquarters wasn’t the Cartier family’s vision for the future. By 1910, the three sons were overseeing Cartier’s overseas branches in London and New York. Cartier remained a family-run operation until 1964, following the passing of Pierre. Louis and Jacques both had predeceased their brother in 1942. Classic Cartier: In the 21st century, Cartier is owned by Richemont, a conglomerate that owns other luxury brands including Van Cleef & Arpels, Jaeger, Vacheron Constantin and Piaget. More than nine decades ago Cartier was partnering with each of those companies, producing “white-label” watches to be sold under their own brand names, according to Collectors Weekly. One of the earliest and most innovative partnerships in Cartier’s history was with Jaeger, the company behind the movements in Cartier watches. A square-shape 18K gold Cartier Tank, circa 1962, gifted to Jacqueline Kennedy in 1963 and worn regularly, was part of an affinity lot that sold for $379,500 at an auction presented by Christie’s in June 2017. Christie’s image. 1. Tank: This year marks the 100th anniversary of this iconic Cartier model. Various historical accounts attribute the name and styling of the watch to the military armament by the same name first used during World War I. The first examples of this watch were given by Cartier to members of the American Expeditionary Force, according to A Blog to Watch. As is the case with many sought-after collectible items, the stories and provenance related to the antique and vintage watches undoubtedly add to their appeal at auction. This was evident recently, when a Cartier Tank wristwatch owned and regularly worn by Jacqueline Kennedy more than doubled its estimate at a summer 2017 auction at Christie’s. According to Christie’s auction preview, Mrs. Kennedy’s watch was a gift from her brother-in-law Prince Stanislaw “Stas” Radziwill, husband of her sister, Lee Radziwill. The watch’s engraving adds to its historic relevance. It bears the engraved inscription, Stas to Jackie, 23 Feb. 1963 2.05am to 9.35pm. The words correspond to the date and duration Radziwill and friends spent completing a 50-mile hike at Palm Beach, Florida. The hike was tied to President Kennedy’s aims to make America a fit nation by making health and wellness a priority. The first lady and her sister were driven to a section of the hike to meet up with the walkers, and at various points during the hike, President Kennedy was also said to have joined the endeavor. Radziwill’s gift was not the only gift commemorating the event. The first lady created a painting depicting Radziwill and one of his friends on the hike and inscribed it similarly to what is seen on the watch: February 23, 1963 2.05am to 9.35pm /Jackie to Stas with love and admiration. The painting, paired with the watch, formed the lot that sold for $379,500 at Christie’s June 21, 2017 auction. 2. Santos: As Cartier history reveals, this famed watch model (the company’s first style for men) came about as a solution to a friend’s problem. The friend was noted aviator Alberto Santos-Dumont. The issue he relayed to Louis-Francois Cartier was the frustrating challenge of accessing his pocket watch while at the controls of a plane. Cartier went to work and in 1904 approached Santos-Dumont with a watch that had an easily visible face, sat flat on the wrist and was held in place by a strap and buckle. 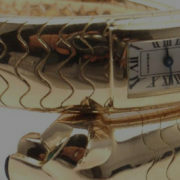 In no time, the watch – which Cartier named the Santos – also became known as a pilot’s watch, according to Monochrome. The watch was made available to the public in 1911. 3. Tonneau: One of the earliest readily available wristwatches created by Cartier, the Tonneau appeared on the market in 1906. Named for the shape of the case (tonneau is French for barrel), it was an incomparably sophisticated design for the time. This model of Cartier watch was introduced during the Belle Époque period, an age during which Cartier’s watchmaking business flourished. Collecting Tip: Two sets of numbers are stamped on the backs of Cartier watches made from about the mid-20th century onward. The 4-digit number is the model number, while the 8-digit number is the serial number. 4. Crash: Steeped in urban lore, this model of Cartier timepiece was inspired by the result of an accident, or heat exposure, or possibly Salvador Dali’s Persistence of Memory. According to an article by George Cramer for Revolution.watch, it was 1967 and Jean-Jacques Cartier, the head of Cartier’s London office at the time, designed the Crash style of watch after seeing a warped Cartier timepiece. Regardless of the source of inspiration, the radically uncommon watch captured the world’s attention. Three times in the years since its debut (1991, 1997 and 2013), Cartier has released limited-edition versions of the Crash watch. 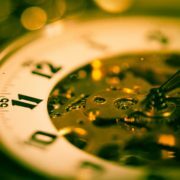 This year marks the 50th anniversary of the Cartier Crash and chatter on horological sites is rife with speculation (perhaps hopefulness) about a re-release of the Crash in 2017. 5. Ballon Bleu de Cartier: This Cartier model appeals to both men and women, making it modern choice. The shape of the case is circular, with both the top and bottom featuring a rounded design. 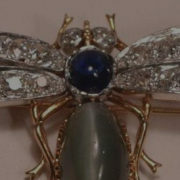 Another uncommon design element of the Ballon Bleu is the inclusion of a guard over the traditional Cartier sapphire cabochon crown.As historical records demonstrate, the connection between Cartier and royalty dates to the company’s earliest years, when King Edward VII of England famously referred to the company as “the jeweler of kings and the king of jewelers.” Today, that connection continues, as England’s Duchess Kate Middleton is often photographed wearing a Ballon Bleu Cartier watch.